Archiving is a feature in Mail that allows you to save your emails onto your Mac’s hard drive, so you can archive emails you no longer need if you don’t want to delete them. There are several ways to move messages into an archive. If you would like to archive your messages by content (project, subject, sender name, size, etc. ), you can place your messages in content-specific folders and archive the folders manually. This method takes more time than automatic archiving (see below), but it gives you more control over what/when items get archived. 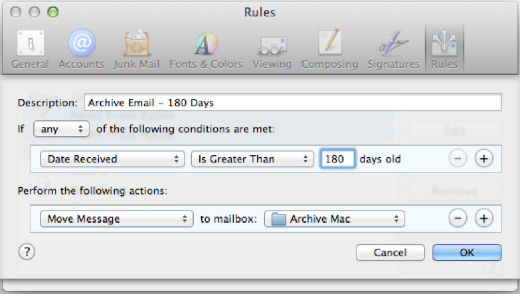 If you would rather archive your messages by date, you can get Mail to move email older than a specified time to an archive location/local folder on your computer automatically.